Come sit down for a session with our Tabla Pro! But don't get too comfortable. Our tabalji will blow your mind with his virtuoso tabla playing and inspire you to greater heights in your own musical journey. You will swear there is a real person playing tabla for you! What’s New in v9.7: With native 64-bit iOS 9 support plus Audiobus 2.2.2 support: Now you can stream live audio directly to other Audiobus-compatible apps! See http://audiob.us for more information. Also new: Karaoke Add-On including Recording (in-app purchase). Demo Track: Click here for Prasad singing a serene piece in Bairagi Bhairav to the accompaniment of iTablaPro. Right-click and save to get your own free copy! Note: iTablaPro includes all features of iTanpura plus a lot more! And as of version 5.1, iTablaPro is a universal app with iPad native resolution graphics. ★★★★★ "FANTASTIC app for riyaz"
★★★★★ "Best app ever, all I can say is WOW"
★★★★★ "Finally a first-class app to replace expensive mediocre hardware"
The Tabla is a percussion instrument widely used in Indian Classical music both as a solo instrument and as an accompaniment to vocal or instrumental music. In recent times it has also gained acceptance in western and fusion music. It has two pieces - the left part or the "baya" provides the heavy bass while the right part or the "daya" provides the main percussion sound. iTablaPro is an electronic tabla and tanpura (drone) player for the iPhone and iPod Touch. But even more importantly, it is the first electronic tabla and tanpura that actually sounds like the real thing, ideal for Indian Classical musicians and students. It includes support for all common taals used in Hindustani music, making it the perfect companion for daily riyaz (practice). ✓NEW AudioBus support: Now you can stream live audio directly to other Audiobus-compatible apps! See http://audiob.us for more information. ✓NEW Karaoke Add-On with Recording (optional): With the new Karaoke add-on, you can now sing into the device microphone and hear yourself to the background of iTablaPro. Requires either headphones or external speakers to avoid microphone feedback. 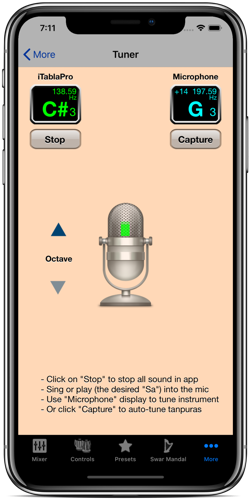 What’s more, starting with version 9.2, the add-on includes Recording - so you can create a complete recording of you singing or playing your instrument with the backup of iTablaPro right from within the app. These recordings can then be sent to another app that supports import or emailed. The recordings are also available using iTunes File Sharing. ✓Tap Tempo: Just tap out a beat on the lower display and watch the app sync the tempo! ✓Presets: Save your frequently-used combinations of pitch, tanpura & swar mandal tuning, taal & tempo as named presets. Includes presets for the 100+ most popular raags plus you can create unlimited custom presets. And now you can also export/import presets via email or iTunes File Sharing. ✓Automatic range selection (ati-vilambit, vilambit, madhya, drut & ati-drut) based on tempo slider. The slider range auto-adjusts to the taal. NOTE: All this information can also be accessed within the app’s online help accessed by clicking on the i (info) button on the top right of the main tab. Pitch Controls: The top section is common to all the instruments (tanpuras, tabla, sur-peti and swar mandal) and is used to set the "base" pitch of Sa. ➡The display in the middle shows the current note name (i.e. C#) in the center, the octave on the upper right, and the current fine-tune relative value on the upper left. The color of the text in the display indicates whether the fine-tune slider is exactly in the middle (green), to the left of center (yellow), or to the right of center (cyan). Mixer: The bottom section contains the mixer used to turn all the instruments on or off, and set their relative volume and panning. ➡Master Volume: Slide the mixer controls down to display the master ON/OFF and volume controls. If an Apple TV or other AirPlay-enabled device is in range, the Audio Route control is also shown. Tabla Controls: The top section is used to pick the taal, the Style and the tempo. ➡Use the Taal left and right buttons to select the taal. Or click on the taal name to bring up a taal selection picker. ➡Each taal has one or more Styles. Use the Style left and right buttons to select a Style (if available). Or click on the style name to bring up a style selection picker. ➡The Tempo Display in the middle shows the current matra in the center, the tempo range on the bottom, the tempo in bpm on the upper right, and the division on the upper left. When the tempo is less than 40 bpm, the display also shows a dot for each quarter-matra to the right of the matra. ✦To use the Tap Tempo feature, simply start tapping the beat on the tempo display and watch the tempo match your tapping! ✦Manjira: When a taal supports Manjira (such as Bhajani, Dadra or Rupak), a Manjira button is displayed under the tabla play/stop button. Click on the M button to enable/disable manjira (the button turns green when enabled). Presets Tab: The Presets tab lets you load presets, delete existing ones, or save new presets. iTablaPro ships with a few presets, but you can add your own as well as delete the existing ones at any time. To restore the original factory presets, just reset the presets from the settings page. A preset saves the state of all currently playing instruments. ➡The presets table shows the details of the preset in a subtitle including the pitch, the tuning of the tanpuras, the taal, the tempo and the style. ➡To play a preset, simply choose the name from the list of saved presets. To only load portions of a preset, turn off one or more switches. For example to load everything from the preset except the pitch, turn off the Load Pitch switch. ➡To update a preset, first choose the preset and make sure everything you want to include is playing (important!). Then click on the (+) icon on the top right. Keep or edit the name for the preset when prompted, click OK and you're done! ➡To create a new preset, first set the pitch, the Tanpuras, Tabla, Taal, Swar Mandal, etc. Make sure everything you want to include is playing (important! ), and then click on the New Preset (+) icon on the top right. Enter a name for the preset when prompted, click OK and you're done! ➡Favorites: Click on the star on a Preset to mark it as a favorite or remove it from the favorites. Use the control at the top of the page to toggle between showing all presets and just favorites. ➡To email a preset to someone else, first select the preset, click on the action button on the top right and choose Email Selected Preset. To send the whole list of presets (or simply back them up) choose Email All Presets from the action menu. To import presets received via email, open the email on the device, click on the attachment, and choose Open in iTablaPro. ➡Click on the black bar at the bottom of the screen to show/hide the controls. You can use these controls to choose which aspects of the preset are loaded when you choose a preset. For example to load everything from the preset except the pitch, turn off the Load Pitch switch. ➡Open iTunes on your Mac/PC and connect your device. ➡When the device appears in iTunes, click on it to select it. ➡On the right, go to the Apps tab and scroll all the way down to the File Sharing area. ➡Choose iTablaPro in the list of apps, you should now see the iTablaProPresets file in the Documents area on the right. ➡You can drag this file to your desktop to back it up. ➡To restore the presets or copy them from another device, simply overwrite this file with a previously backed up file or a file backed up from another device. You can also share presets among devices this way. WARNING: Do not manually edit the presets file or you may corrupt the presets. In case of error, you can restore the original presets from the Settings screen. Swar Mandal Tab: The Swar Mandal tab lets you configure the Swar Mandal settings. The Swar Mandal has 15 strings each of which can be assigned to a note. This screen lets you configure what notes to play, how loud to play them and whether to play them once or repeat them at a certain loop duration. Tuner Tab: The Tuner tab lets you tune external instruments to iTablaPro, or vice-versa. NOTE: This requires an iPhone or an iPod Touch (2nd/3rd gen) with an external microphone connected to it. ➡The display on the right shows the pitch of the external instrument as measured via the microphone. The color of the text in the display indicates whether the external pitch is the same (green), lower (yellow), or higher (cyan). ➡Or click on the Capture button to auto-tune iTablaPro to the external instrument - this makes the captured pitch the new "Sa"
Settings Screen: Clicking on the Gear icon on the top left takes you to the Settings screen. This screen lets you change the application's global settings. ✦Lock Screen: This is the default iPhone behaviour where the screen auto-locks after a period of inactivity. You can control the auto-lock timeout period from the iPhone's main settings area. This option consumes the least battery. ✦Dim Screen: This option disables screen lock and instead dims the screen after a few seconds of inactivity and displays a bigger version of the tabla display. Click on the screen again to brighten it. This is the default setting and the recommended option. ✦Stay On: This option disables the screen lock AND keeps the screen at its regular brightness (so in effect there is NO screen saver). This option consumes the most battery. ➡Reset Presets to Original: Clicking on this button will reload all the original presets the app came with. You can choose whether to delete the existing presets or keep them. NOTE: If you have any existing presets with the same name, they will still be over-written. 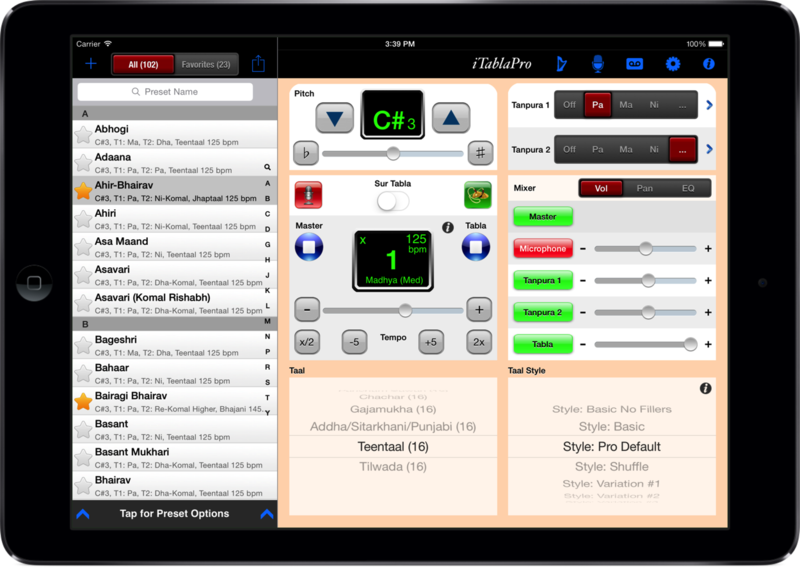 iTablaPro is a universal app - this means you buy it once and it works natively on the iPhone, the iPod Touch as well as the iPad. The iPad version has a similar layout except most of the major controls are accessible on one page. The Swar Mandal, Tuner, Settings and Info pages can be accessed via the toolbar buttons on the top right. And yes it works great on all iPad models! Click the picture below for a larger view. Choose Pa, Ma or Ni on the tanpuras depending on which notes are present in the raag (scale) being performed. If the raag has Pa in it, then typically the first tanpura is always tuned to Pa. If there is no Pa and there is Shuddha Ma, then tune it to Ma (example: Malkauns, Bageshri, etc.). If there is no Pa or Shuddha Ma, then tune it to Shuddha Ni (such as for Marwa, Sohni, etc.) See the built-in presets for examples of tuning in common raags. ➡iPhone (4, 4S, 5, 5S or newer) with iOS 6.1 or later. Recommend iPhone 4S or later for compatibility with upcoming versions. ➡iPod Touch (4th, 5th Generation or newer) with iOS 6.1 or later. Recommend 5th generation or later for compatibility with upcoming versions. ➡iPad (iPad 2, iPad 3, iPad 4, iPad Mini, iPad Air or newer) with iOS 6.1 or later. Recommend iPad 3 or later for compatibility with upcoming versions. NOTE: The tabla sound is very bass-intensive and cannot be properly heard through the iPhone/iPod internal speaker. For best effect, use a high-quality speaker dock with an internal rechargeable battery or any other good pair of external speakers. Prasad Upasani is a professional musician, teacher and performer who also happens to be a talented programmer with over 25 years in IT. He has a Master's degree in Computer Science and a Bachelor's degree (Sangeet Visharad) in Indian Classical music. He lives in Southern California.